Credit to Sharon Noble, Director, Coalition to Stop Smart Meters in British Columbia, for bringing this information to the public. This would include the microwave radiation and electromagnetic radiation emitted from Smart Meters (AMR, AMI, PLC), from Home Area Network devices and appliances (including AC and thermostats), from Wi-Fi transmitters, from wireless devices in schools, offices, and homes, and from wireless sensors and wireless-connected fire alarms. “This means that the Province (that is we, the taxpayer) will be held liable for claims from teachers and parents of children suffering biological effects from wifi in schools, from homeowners exposed to RF from mandated smart meters on homes, and from employees forced to use cell phones or exposed to wifi at work. Lawsuits in other countries have resulted in huge payments already, and it is only a matter of time before similar lawsuits are filed and won in Canada. “Potentially those who allow such devices, after having been fully informed about the dangers, could be held liable for negligence, and directors’ insurance may not provide financial protection. Directors’ insurance applies when people are performing their duties “in good faith”. It is hard to argue they are acting “in good faith” after having been warned by true scientific experts and by a well-respected insurer. The full letter with policy document is here: www.citizensforsafetechnology.org/Lloyds-of-London-excludes-coverage-for-RFEMR-claims,2,4168 . School Boards Left On The Hook For Wi-Fi Injuries. School officials could be personally liable for exposing children and staff to microwave radiation in our schools. School districts, school boards and school medical health officers have been notified that Lloyd’s of London has now excluded any liability coverage for injuries, “directly or indirectly arising out of, resulting from or contributed to by electromagnetic fields, electromagnetic radiation, electromagnetism, radio waves or noise.” This would include the microwave radiation emitting from the commercial wi-fi transmitters and wireless devices in our schools. Lloyd’s of London, one of the world’s largest insurance companies often leads the way in protection by taking on risks that no one else will. At the end of this article there is a copy of a recent renewal policy which, as of Feb. 7, 2015, excludes any coverage associated with exposure to non-ionizing radiation. In 2011 the International Agency for Research on Cancer (IARC) dropped a bombshell on the wireless industry. They designated exposure to wi-fi radiation to be a possible human carcinogen. As well in the 1990s illnesses resulting from asbestos exposure, covered by Lloyd’s at the time, almost destroyed the insurance company. Due to these issues, it appears Lloyd’s is acting fast to avoid another such financial fiasco by not covering illnesses that result from exposure to wireless radiation. With the Lloyd’s of London announcement, parents and teachers are left with this question: exactly who is liable if their child is harmed by wi-fi in their school? Concomitantly, are the individuals who approved the installation of wireless internet networks in our schools to be held personally liable for negligence? School officials and administrators appear to be in a bind as they have refused to acknowledge the 1000s of peer-reviewed, non-industry funded studies by scientists and medical experts that show that wi-fi radiation is harmful, especially to children. Moreover, their dogged allegiance to Health Canada’s now invalidated safety guidelines have left parents with nowhere else to turn other than the courts. It appears that school boards’ intransigent position on the issue may have left board members themselves vulnerable to being personally sued. “In good faith:” in contract law, the implied covenant of good faith and fair dealing is a general presumption that the parties to a contract will deal with each other honestly, fairly, and in good faith, so as to not destroy the right of the other party or parties to receive the benefits of the contract. “Wilful blindness:” (sometimes called ignorance of law, wilful ignorance or contrived ignorance or Nelsonian knowledge) is a term used in law to describe a situation in which an individual seeks to avoid civil or criminal liability for a wrongful act by intentionally putting him or herself in a position where he or she will be unaware of facts that would render him or her liable. 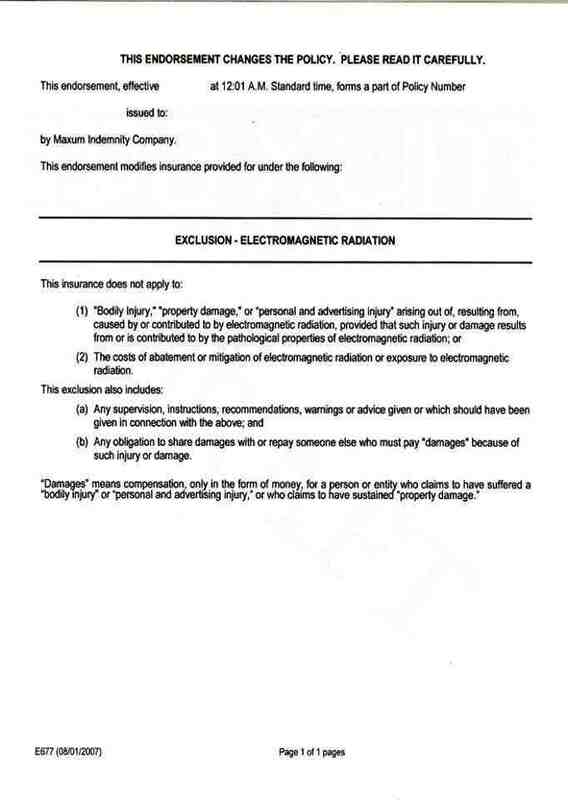 Last week, a couple of blogs noted that a recent commercial liability insurance renewal policy issued through a Lloyd’s of London underwriter contained a liability exclusion clause about electromagnetic fields. It is important that “radio waves” are explicitly included as they, specifically the microwave zone, are what enable wireless communications devices like cell phones, wi-fi, cordless phones etc. Sharon Noble, Director of the Coalition to Stop Smart Meter Harm in British Columbia (Canada) brought the clause and CFC’s response to public attention. My interpretation of this revealing statement is that CFC Underwriting, and perhaps all of “the market” is that the time has come to hedge against a future surge in “illnesses caused by continuous long-term non-ionising radiation exposure i.e. through mobile phone usage.” Why else would they refuse coverage “across the market as standard.”? Lloyd’s of London describes itself as “the world’s specialist insurance market,” and they’ve insured and paid on a variety of unusual risks and catastrophic claims. Unlike many other insurance brands, Lloyd’s is not a company; it’s “a market where our members join together as syndicates to insure risks.” What they insure falls into seven broad categories: casualty, property, marine, energy, motor, aviation and reinsurance. Reinsurance is the key here, as, among other things, it serves “to protect an insurer against very large claims.” Think tobacco, asbestos and climate change. And microwave radiation apparently, even though regulatory and health agencies around the world refuse to accept RF exposure as causing illness. I was seriously intrigued at all of this and emailed an inquiry to the Lloyd’s press center stating that I wanted some more details about the exclusion. I told them that as I primarily produce radio, I’d want to capture the conversation on tape, but would also be happy to talk with someone off tape, but on the record.